Buy one Jacket at full price and receive 20% off the rest of your order. Full price items only. Discount is not applied to any shipping costs, Taxes or Duties. Offer valid March 30th 2018 - April 2nd 2018. 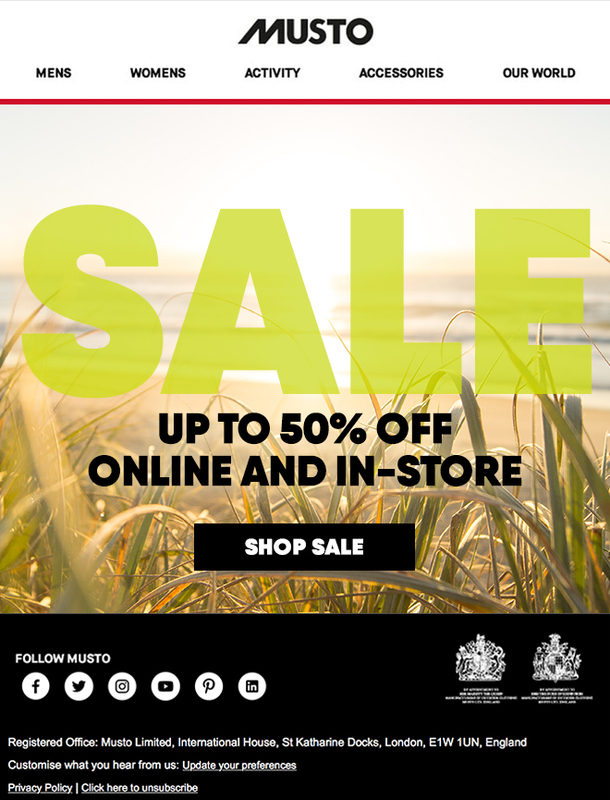 Musto Sale. Move Fast. Up to 50% off. Musto’s specially engineered ski gear provides advanced protection. Waterproof and breathable technology delivers superior, all-weather comfort. And anatomical cuts keep you moving freely. Conquer the slopes. Selected items now in sale. PrimaLoft®. Polartec®. Musto’s industry standard-surpassing fabrics. Act fast to get the best technology for less this Black Friday weekend. Be Prepared. Travel With Musto. Pack right. Resilient fabrics. Highly protective constructions. And contemporary style that takes you from the sea to the streets. Made for the journey ahead. Premium style. Cold weather performance. Timeless knits. Experience seasonal, outdoor-ready warmth. Made from natural cotton and wool blends. Waterproof outer shells that seal out the weather. Lightweight insulated jackets that keep in the warmth. Forget about distractions. Focus on the journey. MUSTO - Your essential welly. Uniquely Patented Non-Clogging Outsoles Ensure Grip. No Matter Where You Are. Cotton-Lined For Added Warmth And Tailored For A Slimmer Fit Around The Leg. Work Hard. Play Harder. And Always Remain On Your Feet. Please don't hesitate to get in touch with any questions about the program or for any assistance you may need. Further details can be found on our Darwin profile. LAST CHANCE - Be a part of history with our exclusive Queen's 90th Birthday Collection. Now 50% off. We have designed specific banners. Additionally if there are any opportunities for increased exposure then please get in touch. MUSTO are proud to be the Official Clothing Supplier at the Royal Windsor Horse Show, the largest outdoor show with international competitions and entertainment spanning over 5 days within the beautiful grounds of Windsor Castle. This year to celebrate Her Majesty’s 90th Birthday there will be a spectacular equestrian-themed commemoration in Windsor Castle's Private Grounds in the evenings of the Royal Windsor Horse show. For both unique events MUSTO have created two dedicated collections. Stay comfortable and cool on those active summer days. This offer is only available in the United Kingdom and United States.